MICHIGAN TRUTH SQUAD ANALYSIS: "Generations" and "Theresa Abed"
Truth Squad calls: Foul on Shaughnessy, Foul on Democrats/Abed. Questionable statement: "Her opponent, Theresa Abed, voted for lifetime healthcare for county politicians, like herself." "Individuals who have served as a county commissioner for at least 25 years are eligible for health insurance paid for by the County. These individuals will be eligible as they continue their service as a commissioner and after they are no longer active as a commissioner." The resolution was a modification of a December 2006 resolution — enacted before Abed was elected to the board. (The practice is for the previous board to set pay and compensation before the new one takes office.) The 2008 resolution restated other compensation provisions, on things such as mileage, per diems and retiree health care using identical language. The Michigan Republican Party launched the same attack against Abed when she was running for the state House against Shaughnessy in 2010. The Michigan Truth Squad called a foul against that ad. This one recycles the same distorted representation of the facts. The ad also implies some likelihood that Abed would benefit from the retirement benefits herself. That's most unlikely since she only served four years as a commissioner before deciding to run for the state House instead. Questionable statement: "Deb Shaughnessy leads by example, voting to end lifetime benefits for lawmakers, including herself." After years of debate and public outrage, the Legislature voted in 2011 to end the practice of giving retiree health benefits to legislators at age 55 after serving six years. In previous sessions, bills to end the exceptionally generous benefits would overwhelmingly pass one chamber or the other (with lawmakers taking credit along the way), but the House and Senate would never pass the same version in the same session to send it to the governor. This time, they did, and Gov. Rick Snyder signed it into law. The measure, Public Act 200 of 2011, continued the benefit for lawmakers who reach the six-year threshold by January 2013, but eliminates it for others. Shaughnessy, who voted for the bill, is among those no longer eligible for retiree health-care benefits. Overall impression: Shaughnessy portrays herself as a leader in the fight for strengthening Michigan's economy by supporting pro-growth policy. She has been supportive of the Republican agenda that has cut taxes for business, and she credits those policies for improvement in Michigan's economy, including growth in employment and a lower unemployment rate. But the ad misrepresents the intent and impact of Abed’s vote as a commissioner. Foul or no foul: Foul. The Shaughnessy campaign recycles a Republican Party attack against Abed from 2010 -- an attack the Truth Squad whistled that year. The claim hasn't improved with age. Questionable statement: "A new tax on retirement income that costs every retired couple $3,000 more every year. ... In Lansing, politicians added a new $350-million tax on retirees ..."
Questionable statement: "A new $400-million tax on all health care claims -- from getting urgent care to filling prescriptions." This is a variation of a claim made in a Democratic Party ad vetted by the Truth Squad on Sept. 6. We called a foul on Sept. 6, in part because the ad "oversimplifies the Medicaid/prescription tax issues." That analysis found that the Legislature had "... implemented a 1 percent tax on health insurance claims paid by health insurance carriers and third party administrators. 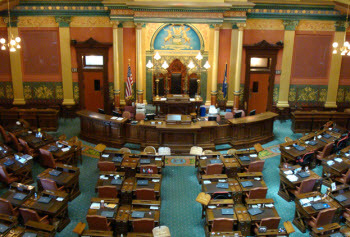 It replaced a 6 percent use tax on Medicaid health maintenance organizations and was backed by AARP Michigan. If maintained, it would provide $400 million in Medicaid funding and trigger an $800 million federal match. "The new tax became law on Sept. 20, 2011 and took effect on Jan. 1, 2012." Questionable statement: "Income taxes increased by $1.4 billion." A July 2011 analysis by the House Fiscal Agency said that the tax changes adopted by the Legislature in the spring of 2011 would generate a projected $1.423 billion in additional revenue from personal income taxes. Questionable statement: "And for what? To pay for $1.8 billion in tax giveaways to CEOs and corporate special interests." Gov. Rick Snyder's first budget plan, presented in early 2011, including a fundamental change in business taxation in Michigan, shifting to a 6 percent corporate income tax. According to the Senate Fiscal Agency, this shift would result in a reduction of $1.658 billion in business taxes in its first full year. The change eliminated a direct business tax on scores of smaller businesses, so-called S Corporations, partnerships and others. Questionable statement: On the Eaton County Commission, Theresa Abed voted to cut her own pay, end lifetime health care benefits for politicians and presented a balanced budget four years in a row." As detailed in the 2010 Truth Squad analysis, Abed, as a county commissioner, voted for a 5 percent pay cut. In January 2007, the Eaton County commissioners voted to eliminate retiree health-care coverage for all county employees hired after Jan. 1, 2007. According to the county comptroller's office, this policy, "by default," covered all county elected officials elected after Jan. 1, 2007. Commissioners elected prior to that date -- and who serve at least 25 years -- would remain eligible for retiree health-care coverage. According to the state Treasury Department, the state's Uniform Budget Act's purpose "... is to require that all local units of government in Michigan adopt balanced budgets." Overall impression: In the mailer, the Michigan Democratic Party attempts to contrast their candidate, Abed, as a prudent budgeter vs. what it sees as imprudent tax changes by the Michigan Legislature. And since 2011, the Legislature has moved to reduce state taxation on businesses while increasing the burden on individual filers. Foul or no foul: Foul. The tax changes wrought by the Legislature do not increase the tax burden on "every retired couple" by $3,000 every year. And while the amount of the health claims tax is properly described, the ad does not explain the context of the issue.